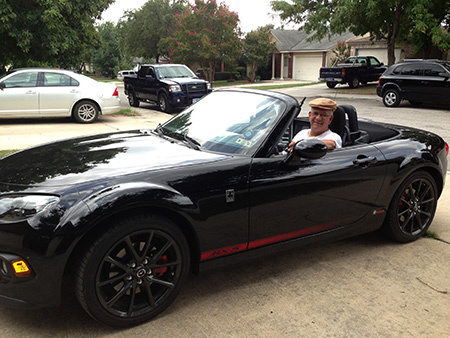 Congratulations to Ken on the selection of his 2013 Club Edition as the November Miata of the Month! It all started in 1990. 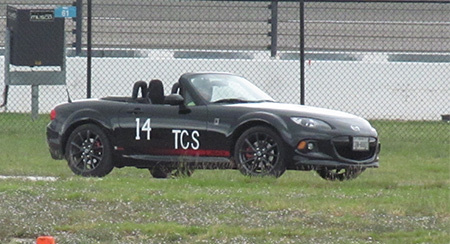 Those little impractical 2-seater Miatas started dominating the autocross circuits and eating my lunch! Well, if you can't beat 'em, join 'em. But I never had the chance. You see, it was this condition known as "Married with Children". You know, that era when your life is dominated by mini-vans and the need for hauling kids with bicycles. But the Miata dream never went away. It just seemed that there was always 'something' that kept me from buying one. Fast forward to 2013. Divorced, retired, and the Miata dream kept returning. On that fateful day, I actually did some research and decided that the Scion FRS was the more practical car, as I had read a comparison article that stated the Miata Club and FRS were identical performance-wise. So off I went to the Scion dealer and drove one. NICE! But the dream persisted. Immediately after driving the FRS, I went up the street to the Mazda dealer. OMG! There it sat, a black rag-top Miata Club. (Quiet! - my pounding heart!) Impractical, I told myself. Noisy convertible, I told myself. Well, I'm here, might as well drive one. I was sold as soon as I put the top down and drove off the lot with the salesman. FUN! was the only thing I could think of. The right brain - left brain battle was on! You know which one won. Bought it on June 18, 2013 and still put the top down every day that it isn't raining. You know...that FUN! thing. So here is mid-October 2013. Yep, still FUN! Took it to my first autocross in July, and really had FUN! but didn't do so good. HHHmmmmm, what's up with that? When I was autocrossing, I never finished less than 2nd in my class at local events, with 98% first place finishes (1970 Datsun 240Z; 1979 Mazda RX-7). 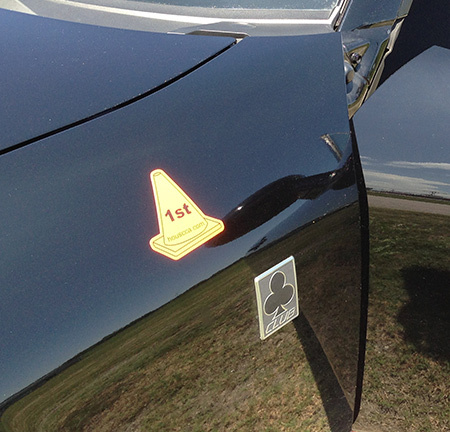 Yea, I'm a pretty decent driver; even finished 3rd and 6th in 2 SCCA National SOLO II events. Well, now that SCCA lets you run race rubber in stock classes, that meant a lot. All finishers in front of me were running race rubber. Different class next autocross. I ran the street tire PAX class at the next one and got stomped again, but was pretty fast for a street tired Miata. It was still a BLAST! Top down, gear grindin', tire slidin' FUN! What to do? I started searching the web for "Miata performance". 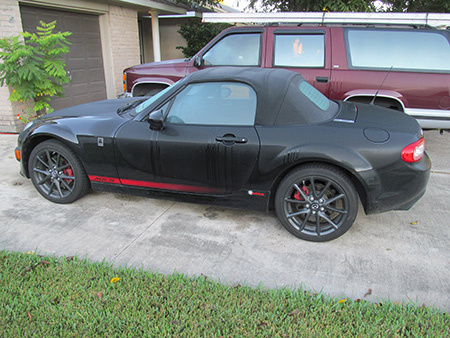 I found Flyin' Miata, and finally found Miata.net, and started reading the forums. WOW! A treasure trove of information! Wanting to stay in the "stock" class for SCCA, I thought I'd start with the Flyin' Miata wheel alignment suggestions. Researching and calling shops that did alignments was an experience. 3 out of 4 shops told me that if I wanted the alignment to my specs, that there was 'more work' and 'extra time' involved, so it would be a lot more $$$. Sheesh, I guess I sound DUMB on the phone. So on the 3rd idiot that told me this, I asked, "Really? So just how much more work and time does it take your mechanic to turn that adjusting bolt 3/4 of a turn instead of a 1/2 turn?" I didn't wait for a response. Anyway, I aligned the car to the Flyin' Miata specs. First thing, like right away, I noticed a much better 'on center' feel, and less wobble over bumps and ruts. FAST FORWARD - Next autocross in my area was Texas Region SCCA, and they were running the Texas Motor Speedway road course! WHOOPEE!!! 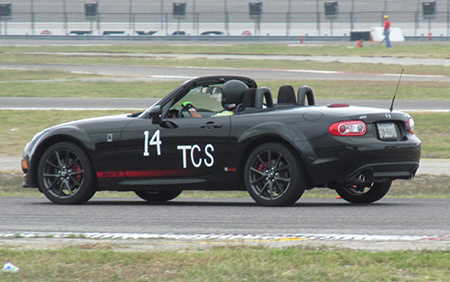 I once ran the Texas World Speedway road course, and it was hands down the best autocross ever! So I called my son in Granbury, TX and told him I was staying at his house Saturday night. Walking the Texas Motor Speedway road course, I knew third gear would get a lot of use! There were some tricky parts, early and late apex, and some very fast parts. That mix always makes a great driver's course. First run, my rev limiter kicked in...twice! Hmmm....shoulda shifted into 3rd. Second run, shifted into third, but still could use some improvement. 3rd run was pretty darn fast, but watching the video I took on my iPhone attached to my windshield, I noticed one mistake. Gotta go faster on that front straight. 4th run - wipeout! Almost hit the fence on the back straight, but I recovered and steered out of it. Missed the fence by about 3 feet! I was the 3rd Miata to wipe out. The unlucky first Miata to wipe out DID hit a wall. I still didn't finish in trophy position, and ran that darn street tire PAX class again. Interesting note - I would have trophied in 3rd place in C Stock. And yes, the first 2 places wore race rubber! The car stays planted pretty darn good with just the Flyin' Miata alignment. Very controllable once the suspension sets, but could use more stability in transitions. Yea, I could use some stickier tires, but want to dial in the suspension first. My son took a video also, and looks like I'm getting a little bit too much front sway. Miata forums say a bigger front sway bar will help. Guess I'll try it out. If you have never tried autocrossing, DON'T! I don't need the competition, and you'll be hooked for life. That's my story and I'm sticking to it!